When the park ranger says there may be some "snow" on the trail, follow up with very specific questions. Find out if trail crampons or snow shoes might be required. The fellow we ran into on an icy section of trail was wearing Hillside Trail Crampons and said they turned him into "Spiderman." Even a cheap set of Yaktrax may have come in handy. About a third of way through the trail my first camera battery died. I had a backup. But it reminded me that cold can wreak havoc on batteries. A super easy solution I need to try: tape a hand warmer to battery door on your camera. This idea was lifted from Intense Angler's: 10 unique uses for hand warmers. 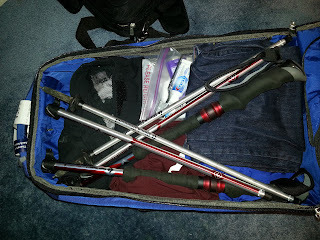 I packed our boots in Tyvek Mailers (one pair of boots per mailer) and then put them in our carry on bags. The Tyvek held up great and kept the boots from making a mess. I was a bit concerned that I wasn't going to fit everything I needed to carry with me in my little day pack, so I confirmed that by attaching a loop of paracord over a folded mailer I was able to make a quick improvised messenger bag. In the end, I didn't need it. I knew better than to try to bring HEET stove fuel on the plane. I brought an empty container and planned to fill it when we got off the plane. In the second gas station I checked I found a bottle of HEET for $2.00. Another option would have been to stop at one of the 3 AutoZones that we passed along the way. My little Alcohol Stove worked great on the trail. Along with the stove and fuel I brought a couple of tea bags and a package of hot chocolate. I was pleased by how effortlessly the rig was to setup, light and be cooking with. I had hot tea in a few minutes. In the end, we didn't need the hot drink along the trail. Had there been some sort of emergency (say falling into one of the brooks we had to cross), it would have been a real life saver. Shira was smart enough to bring an ankle brace, as after more than a few miles into the trek she really needed it. Still, I've ordered a bunch of ace bandages and plan to try wrapping her Ankle using some YouTube instructions. Given how frequently she has ankle issues, we shouldn't be going anywhere without a way to stabilize her ankle. Even with the threat of cold weather, I'm glad I decided to wear my sun hat and Buff, rather than a knit hat. I think it provided the same warmth as a knit hat, and when it was just plain warm and sunny out I was ready for that weather, too. Next frigid winter hike I think I'm going to leave my Adventure Medical Kits Bivvy at home and just bring along a cheap Mylar sleeping bag. Given that I'm only using this item in an emergency, I don't really need the durability of the reusable AMK version. The cheap Mylar version should be more compact and do more or less the same job.